grid 1. players do linear run 1 foot in each rung then still facing forward go to the right through ladders on completion of the 2nd ladder a server serves the ball and player performs a left foot volley as soon as plant their right foot outside of ladders.then turns around 180degrees and proceeds through next ladder with left foot leading once throuh then linear through last set on planting foot outside of ladder server at the end serves and player performs volley. Then player goes to box 2 to start next grid. on walking between each grid players perform lunge matrix. 2.players start at cone and perform right foot laeding lateral in at end they perform volley of left foot then still with right foot leading go out through next ladders. players then perform in opposite direction so now left foot leeading and right foot volley. 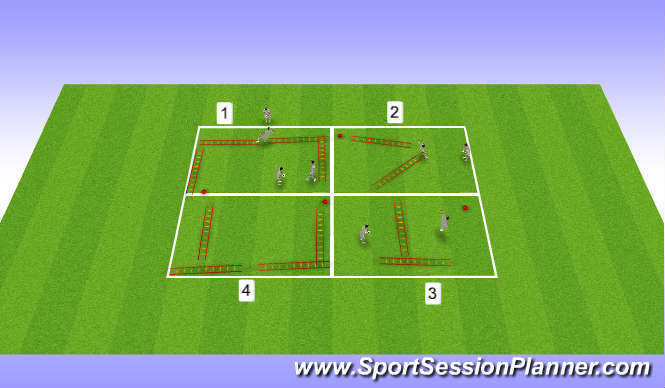 3. in this box players are instructed that they must travel through both sets of ladders but they determine how they perform, encouraging them to be creative . Also the server feeds the ball at any time from any position this is to try and put an element of reaction to an unanticipated stimuli. 4. player perform 2 feet in 2 feet out zig zag through the first ladder then 1 in 1 out left on the next then repeat but now with right foot. on last ladder doing zigzag but now backwards. then players proceed back to first grid. then on next circuit players chest and volley then perform squats between stations. next circuit headers then foot recieve and pass changing feet. in between single dynamiucs of heel and toe, sumo walks and scorpions/spidermans are performed. the last 2 circuits the tempo is increased to get players upto main sessio0n tempo/speed.